In my previous article, I outlined a couple of mistakes I see throwers making with their training. You can check that article out by clicking here. I really appreciate the feedback I got from the Kabuki Strength community, and one of the most common questions was how those considerations actually entered into program design. I thought the most productive way to answer that question was to just open up my old training log and show a sample training week from my final season as a pro. This is my actual in season workout schedule assuming a meet on Saturday. Read my workout schedule in the rest of this article at Kabuki Strength. I built the Hoffa Throws Academy from the ground up to be able to train throwers the way that I feel like they should train. We have an indoor shot ring, two outdoor shot rings, a discus ring, and three extra rings to throw into nets. 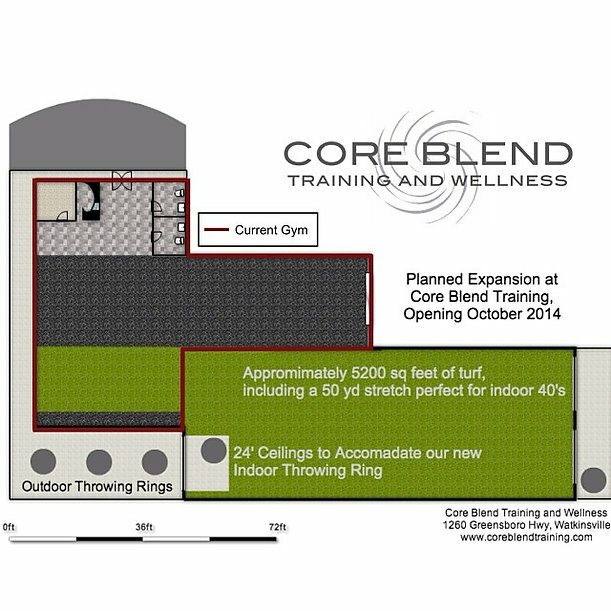 This is all housed within Core Blend Training, a gym I helped start up in 2012, filled with everything I think throwers need. I knew that to be the best thrower I could be, every part of my training needed to be built towards producing long throws and that’s exactly what I did. To read more about the number one mistake throwers and coaches make in their training, read the rest of my piece for Kabuki Strength. 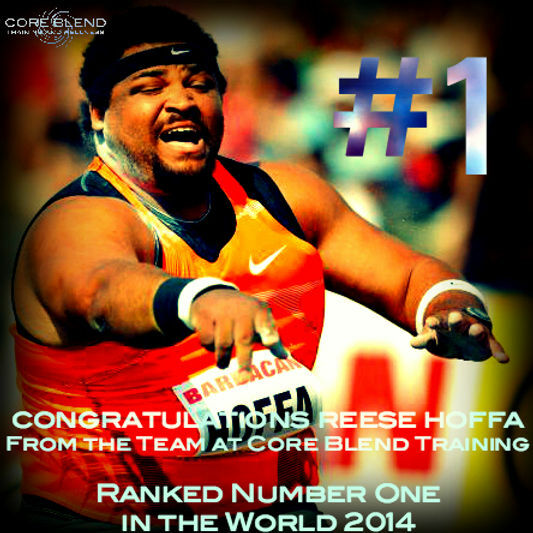 Congratulations to Reese for his number one ranking in the world for 2014. Not only is this an amazing accomplishment itself, but it adds to his streak in the top three in the world, a streak that now lasts ten consecutive years. For a little perspective, this was achieved just once before, by Parry O’Brien from ’52-’61. You can congratulate him yourself here and here. It began as a debate about what defined strong and ended up with a club called the “Core Blend Elite”. The idea was to determine criteria that meant someone was strong. If you could meet or exceed the standard, you were in the club; if you failed, you were not yet considered strong. After a great deal of tinkering, it was agreed that anyone who could lift a combined total of 1200 pounds between Bench Press, Squat, and Deadlift while also being able to do a combined 40 reps between a 225 rep test and chin ups was strong – Core Blend Elite. A sample path to 1200 would be benching 300 pounds, squatting 400 and deadlifting 500. If you’re stronger in any of those areas, you can afford to be a little weaker in the others. These lifts do not all need to be completed on the same day or week; we allow you to bank lifts. The 40 combined reps of 225 and chin ups makes sure you aren’t over fat, and large changes in weight are unacceptable. For example, you can’t bulk up to 250 pounds and knock out the power lifts and then lose weight until you can do chin ups. You should be able to do all of them around the same time. Can you make it into this club? If so, what were the numbers it took to get you there? How far away are you from achieving this feat of strength? Are you ready to tackle this challenge? 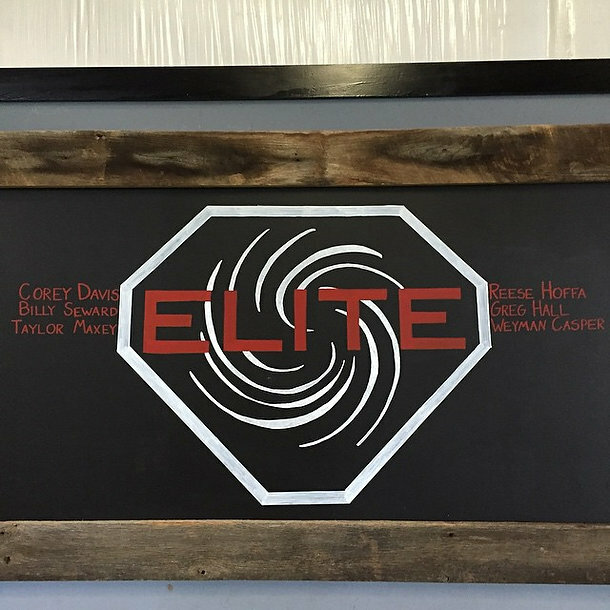 If and when you are strong enough, your name will join the existing Core Blend Elite on the wall. Reese Hoffa squats 600 pounds for a double at Core Blend Training.